Salomon leads the industry making the best trail running shoes out there. 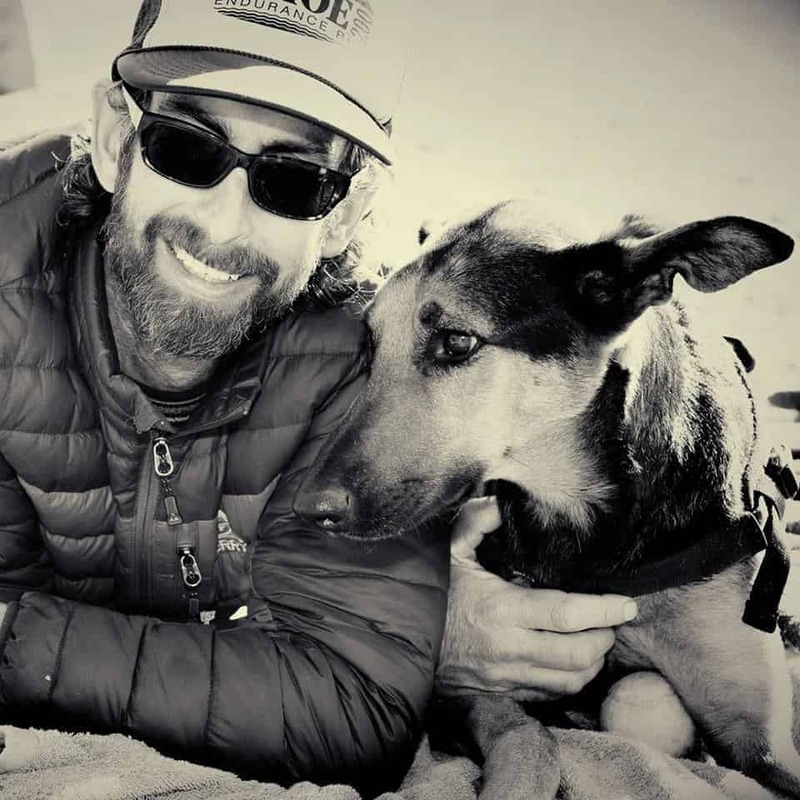 This review is from Mike Tebbutt, Tahoe Mountain Sports Ambassador. 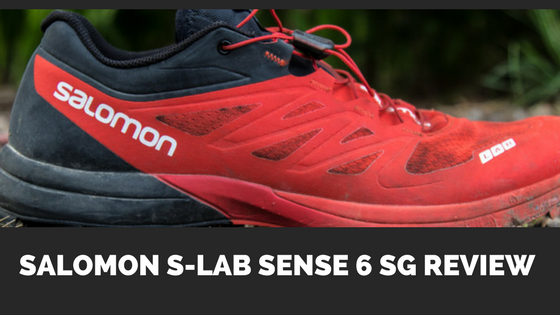 The Salomon S-Lab Sense 6 SG is an elite trail shoe for serious mountain runners. Click here to read about the Best Trail Running Shoes for 2017. I am not a small person at 6’2” and 170 pounds, and enjoy many of my miles on terrain that most folks do not consider runnable. Thus, I tend to burn through my shoes a little faster than your average runner. 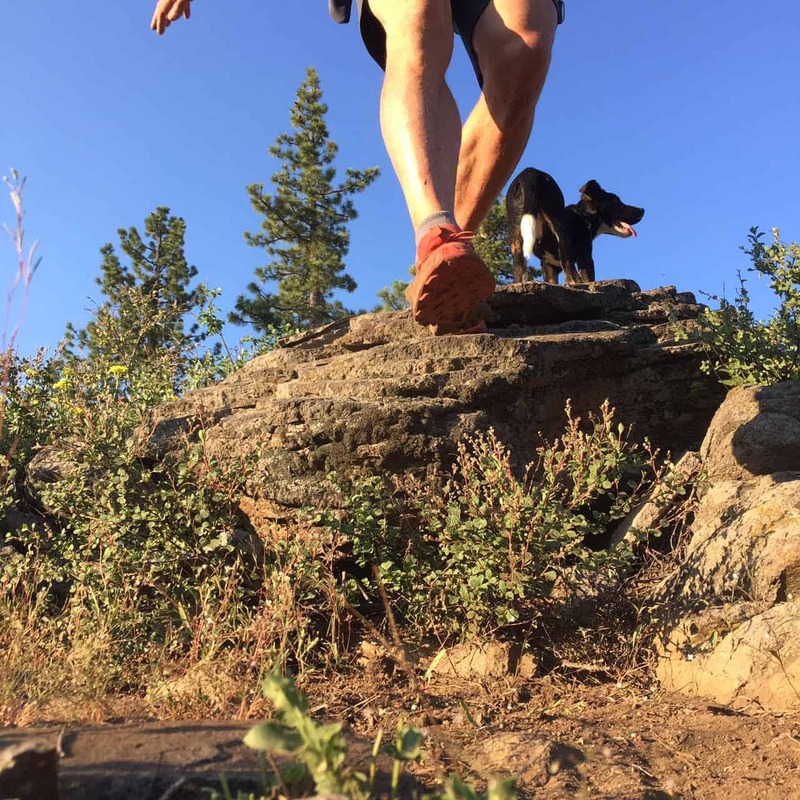 I have a slightly wider foot and enjoy wide toe box shoes like Altra and Topo, for their comfortable roominess on more runnable trails, but also enjoy a good form fitting shoe like the Salomon Sense Series when maximum control is needed on steep and technical terrain. I am fortunate to have the trail start 30 feet from my kitchen door in beautiful Kings Beach, CA at Lake Tahoe, opening to the huge network of terrain towards Truckee and Reno. There are endless miles of trails to link up, serving me and my long distance running habit very well. Most of the rock close to my home is sharp volcanic and has a tendency to shred the uppers of shoes prematurely, while often times still having decent tread on the sole. I usually get about 200 miles out of a pair of shoes before demoting them to shorter runs only for another 100 or so. My favorite backyard trail gains 870’’ in ½ mile at an average grade of 29% and puts all of my shoes through a rigorous test. 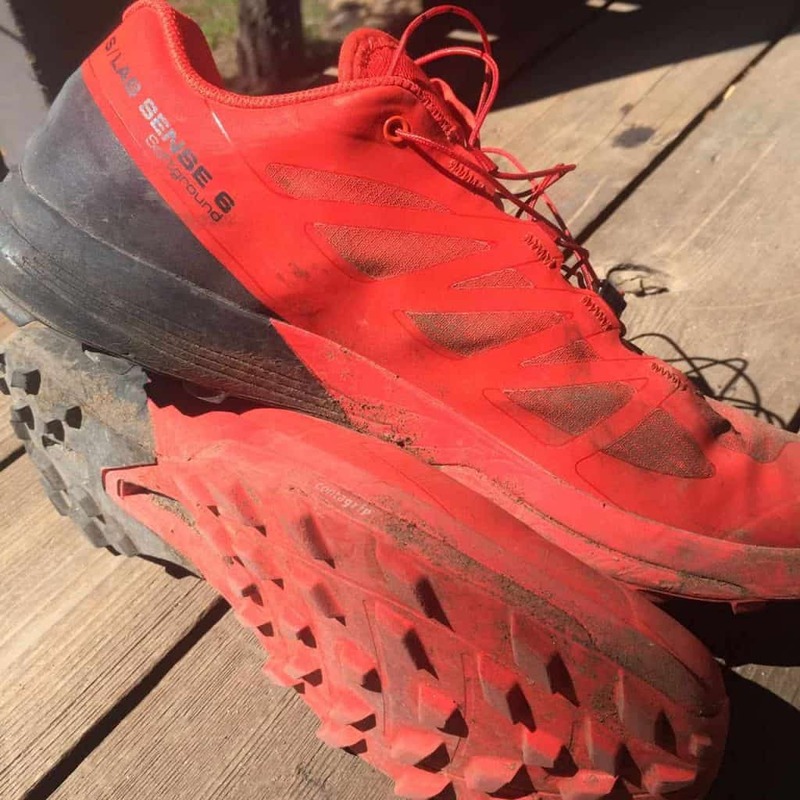 I previously had been running mostly in the Salomon S-Lab Sense 5 Ultra SG, so as expected the Salomon S-Lab Sense 6 SG fits like a glove and is race ready right out of the box, with no need to break it in. I love the precision and secure fit of the trademarked Salomon Sensifit. After cinching the shoe down with the Quicklace system, stuffing the rest of the lace into the Lace Pocket seemed to be easier than in my Sense 5 Ultra SGs, as the pocket does not get trapped under the lace as easily. This had previously bugged me a little bit considering the $180 price tag.Though only 1mm less overall height in both the toe and heel, compared to the Sense 5 Ultra SGs, they felt noticeably more minimilist of a shoe and figured they would not be my go to shoes for really long runs in which my feet get extra tired. For such a lightweight shoe, I am really impressed with how durable the uppers are and how well they hold up. 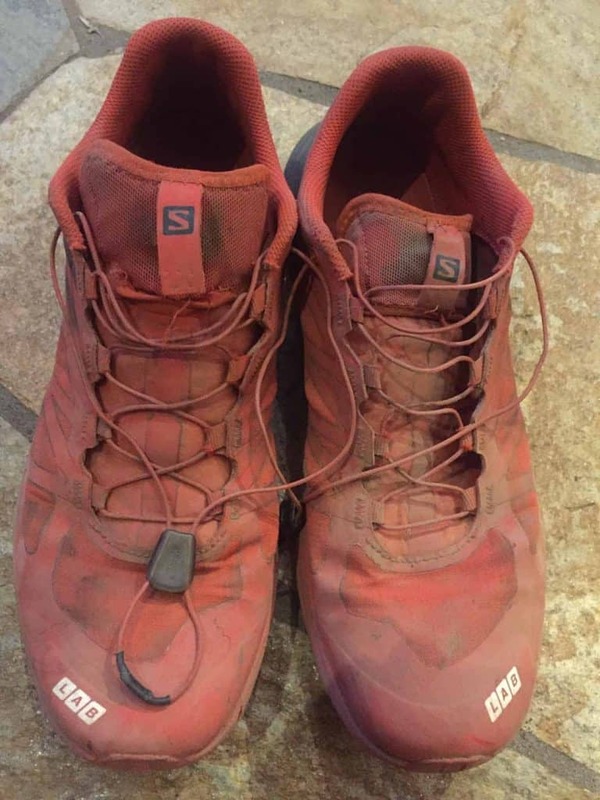 After over 200 miles in them I did not have a single tear in the uppers, even after much off-trail running on sharp volcanic rock. The anti-debris mesh that extends from the sides of the tongue and attaches to the sole of the shoe works great in keeping most debris from making it’s way between the bottom of your foot and the footbed and also creates probably the most comfortable and secure tongue of a shoe that I have worn, as it keeps the tongue from slipping to one side and pinching the top or side of your foot. The lacing system wraps comfortably and securely across each side of the tongue and provides an added layer of protection against rocks and debris. 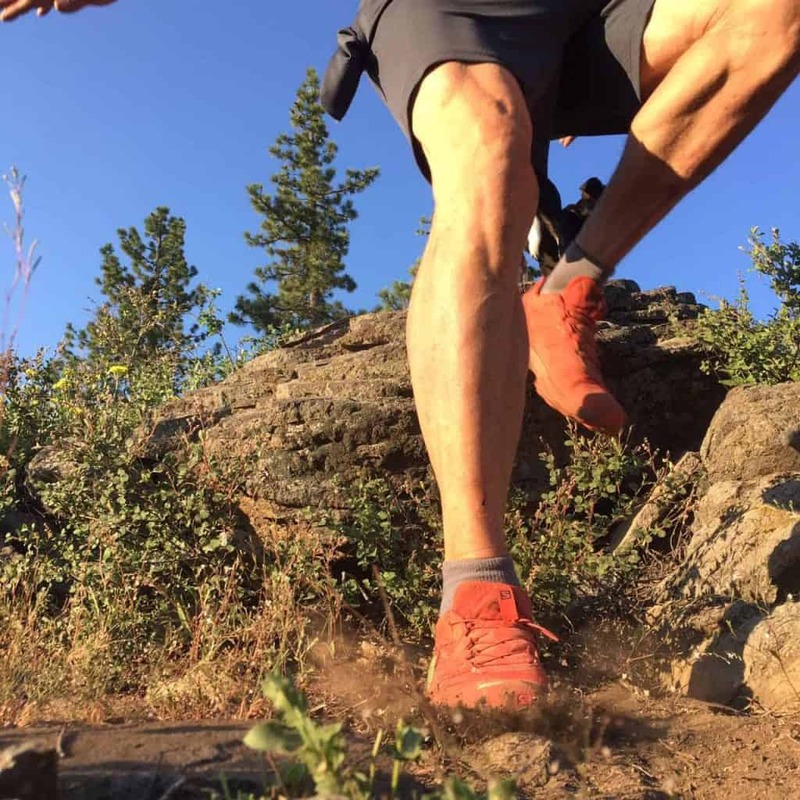 The bumper on the toe of the upper combined with the sole of the shoe wrapping up over the center of the toe provides adequate protection when kicking a rock hard while flying down hills. The Dual Density Compressed EVA foam holds up well and did not compress or break down too much between the first day and mile 200. As a big kid, I appreciate this, since I feel I cannot afford to lose any of the minimal cushioning of the shoe. I feel this also allows me to squeeze a few more miles out of these shoes than a more cushiony and soft midsole that can compress unevenly and cause weird foot tweeks. 60 miles on the shoes now and I am really impressed with how the tread and uppers are holding up to the steep and rocky test I have been putting them through. Salomon’s Premium Wet Contragrip Outsole with the tall Soft Ground lugs provides superior traction in wet and muddy conditions as well as secure traction on steep rock slabs. The sticky rubber that holds so well on dry rock has me looking forward to taking them on High Sierra peak bagging missions that sometimes require up to 4th and easy 5th class climbing. Much like the Uppers, the lugs on the S-Lab Sense 6 SGs hold up suprisingly well over the miles. 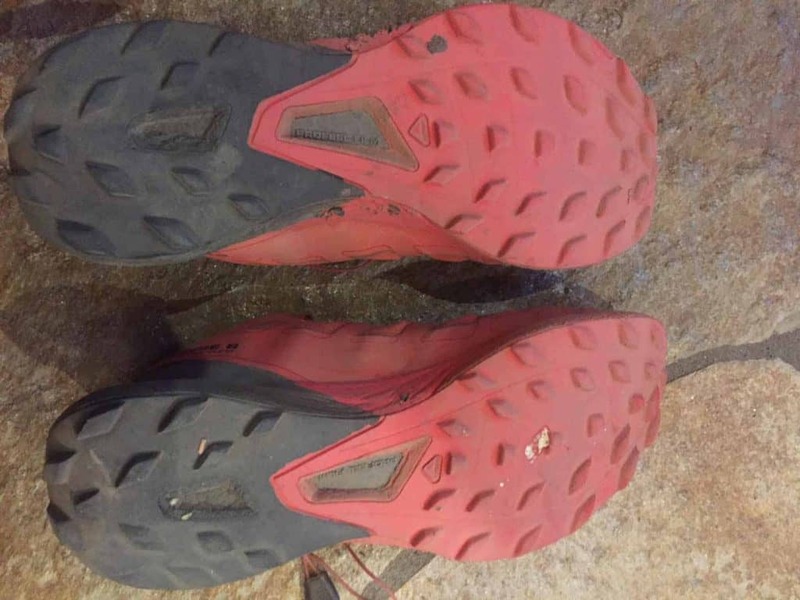 Even though I knew from my S-Lab Sense 5 Ultra SGs that this should be the case, I kind of doubted I would go much over 200 miles in them before wearing them smooth, but after 220 miles they still have as much tread left on them as many trail shoes do when they are straight out of the box. 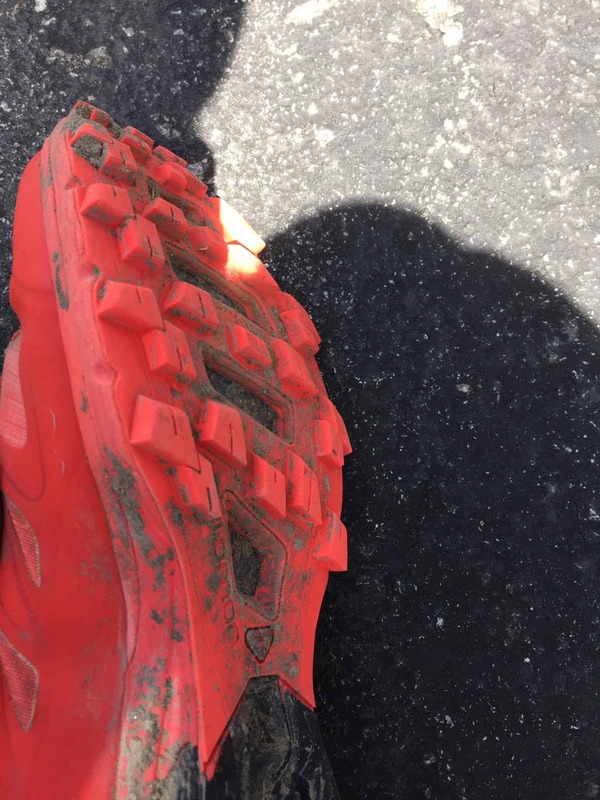 Lots of tread left with just 20 miles on the shoes. At about 120 miles I managed to tear off one end the finger loop on the Lace Pocket, but I am chalking this up to operator error and hasty handling on my part. Lesson learned, treat your gear with care! 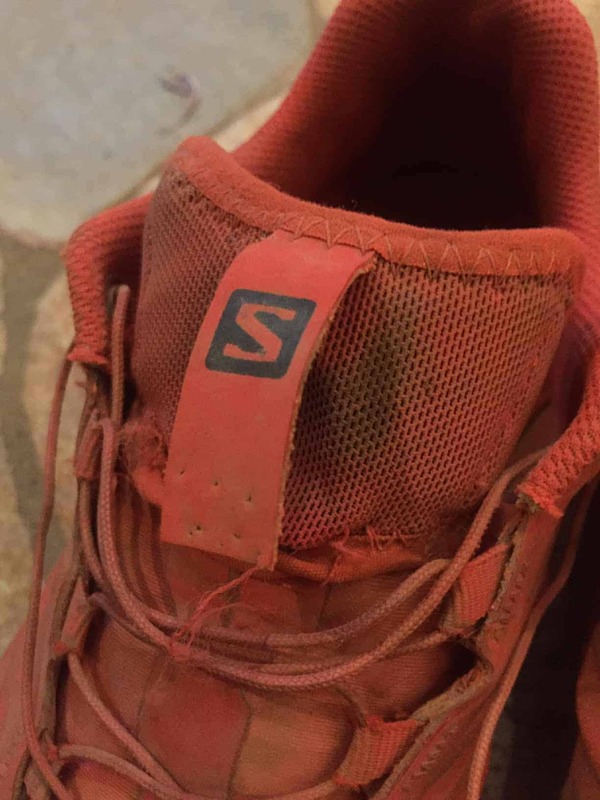 220 miles and no visible damage to the uppers (other than the Lace Pocket loop breaking) and just a tiny puncture in the sole from an extra sharp rock. 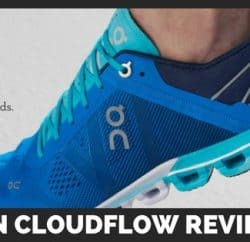 $180 is a LOT of money to spend on a trail running shoe that is subjected to horrendous abuse on sharp rocky trails, but if you are willing to make that kind of investment in a shoe, then this one provides about as much bang for your buck as you can reasonably expect. I feel this is a shoe that all but the narrowest and widest foot will really enjoy. 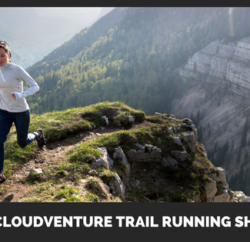 The S-Lab Sense 6 SG will perform well on any type of trail (also felt fantastic on a rubber track), while truly excelling in the most demanding terrain with it’s secure and comfy fit. About the only drawback I found in this shoe is that it quickly feels like not enough cushion for my 170 pounds when I start to break down and get tired feet at the end of a longer run. 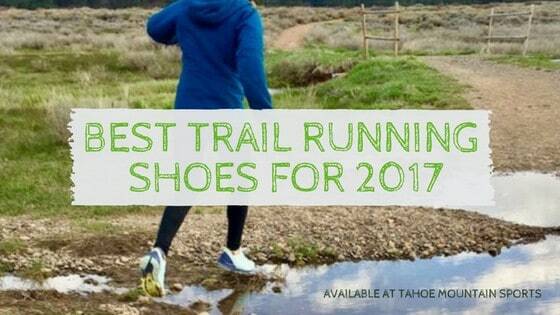 Tell us in the comments below about your favorite trail running shoes. 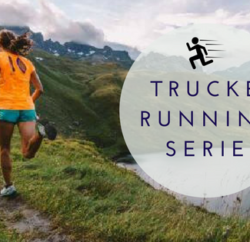 Come into our store in Truckee, California, to get the best trail running shoes for your next hike or click on the links above to buy online.